China is set to start work on a novel design for a nuclear reactor with the help of a firm founded by Bill Gates. Terrapower, founded and funded by the Microsoft chairman, is collaborating with Chinese scientists on the fourth generation (4G) reactor. Research into the 4G reactor over the next five years could top $1bn, said Mr Gates. Developing such a reactor could take a long time because none have been built or tested yet. "The idea is to be very low cost, very safe and generate very little waste," said Mr Gates during a talk at China's Ministry of Science and Technology during which he confirmed the tie-up with Terrapower. He said talks between Terrapower and China's National Nuclear Corporation were still at a "early stage". The company has also talked to other nuclear nations such as India and Russia about its 4G research. Based in Washington state, Terrapower is working on a design for what is known as a travelling wave reactor. This uses depleted uranium as its power source and is believed to produce less nuclear waste than other designs. "All these new designs are going to be incredibly safe," Mr Gates said. "They require no human action to remain safe at all times." Any future design would also be built to withstand damage caused by disasters such as tidal waves and earthquakes. 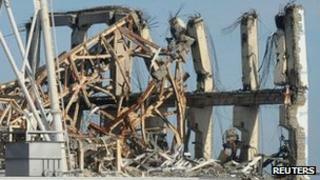 Japan's ageing Fukushima Daiichi reactor failed dramatically in early 2011 when hit by both these natural forces. Mr Gates was in China to talk to its government about a project of the Bill and Melinda Gates foundation that would try to identify and fund research that could alleviate poverty.